On to the tank top. . . I found mine at Joann's in the notions aisle. ***Note: Make sure that your shirt has a good stretch and recovery to it. If it has a little lycra in it it will fit the best and not get so stretched out. 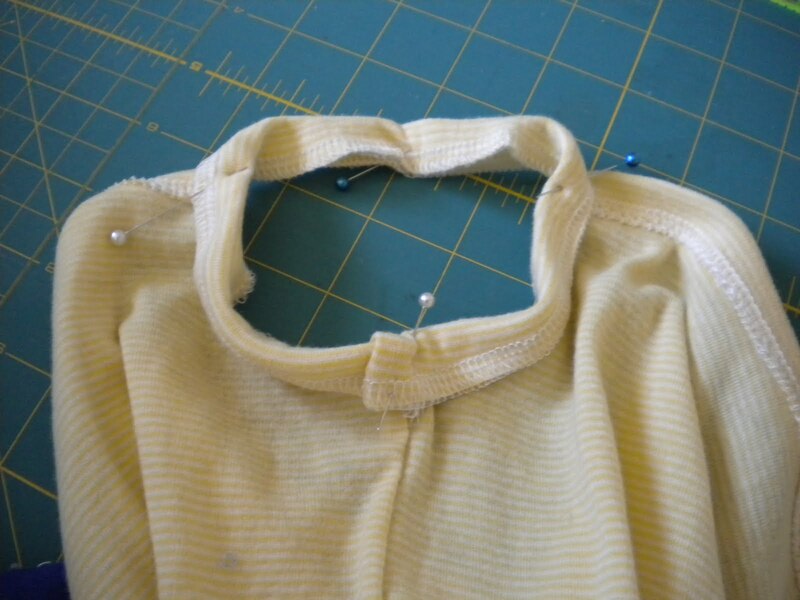 Cut apart your original shirt along the seam lines to make cutting easier. Fold the front shirt piece in half down the middle and place your pattern on it. If your shirt has a nice hem on the bottom, or stretch lace or anything you want to preserve in the tank, place your pattern along the hemline. If you would prefer, you can also make a band on the bottom-- meaning you will want to cut above the hemline. Cut the piece out. Use the same pattern piece for the back of the tank. Cut it out using the back piece of the shirt. Using the remaining pieces from the shirt, you will need to cut several strips that are 2 inches wide by the length of the shirt. You will need two strips that are about 15 inches long by 2 inches wide and two strips that are about 6 inches long by 2 inches wide. These will be your straps and binding for the top of the tank. 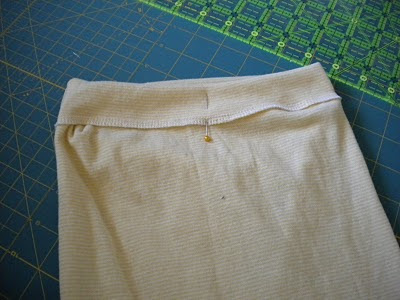 If you want to add a band on the bottom, cut another piece that measures 4 inches wide by the length of the hemline. 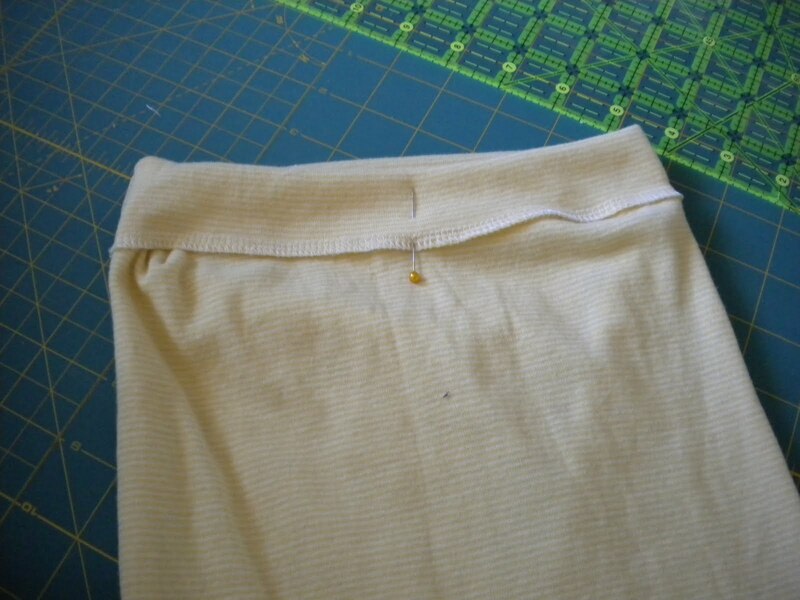 If you need, cut two pieces that are 4 inches wide by 1/2 the length of the hemline. This can also be an inch or so shorter than the hemline, like you would use with ribbing. 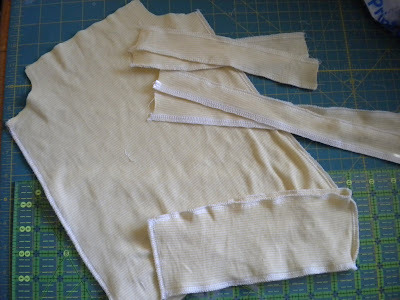 All the strips should be cut so that the stretch of the fabric is on the long side of the strip. 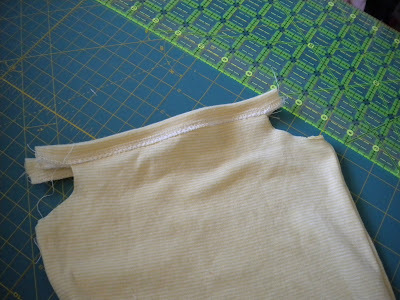 Sew the side seams of the tank top. 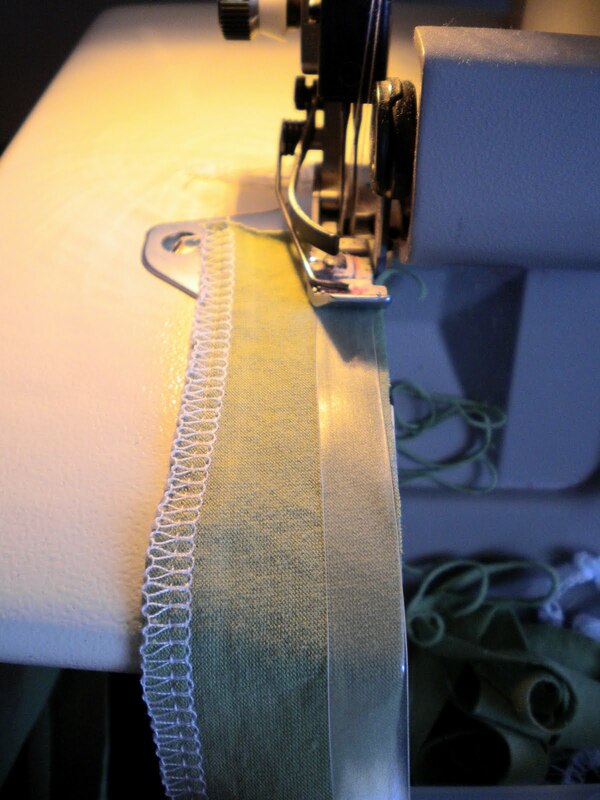 Sew your hemband into a circle and finish the raw edges on the top and bottom of the band with either a serge stitch or a zigzag. 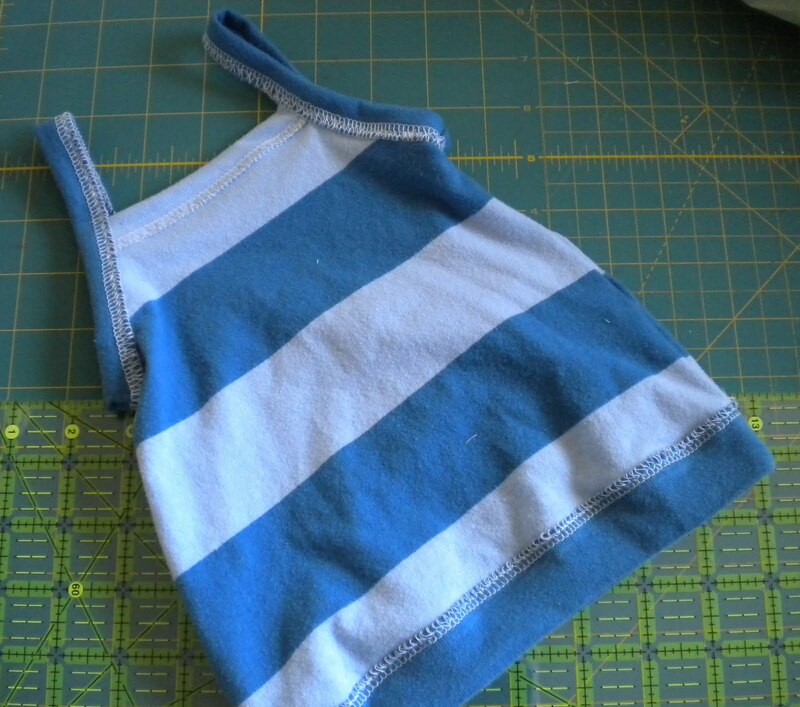 Finish the edges of the binding for the top of your tank with either a serged seam or zigzag. For the second side of the strap, we are going to add the clear elastic to the wrong side of the fabric. 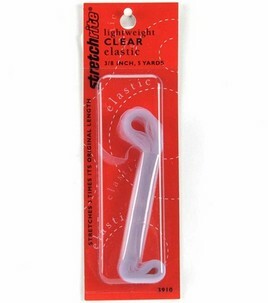 This will help the strap to hold it's shape and keep the straps from falling off the shoulders all the time. 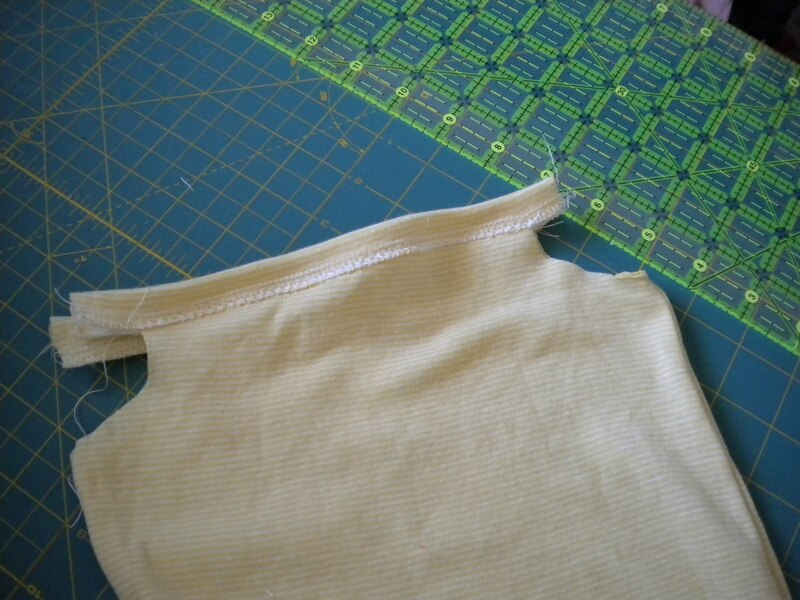 If you use a zigzag stitch, you can add it at the same time as well. Do not stretch either the fabric or the elastic as you go. Press the top binding and hem band in half lengthwise. Sandwich the top of the tank in between the top binding piece, leaving the serged edge visible. Stitch into place using a zigzag stitch slowly, being sure to catch the back and front as you would when sewing bias tape. Finish the other side the same way. Cut the strap pieces to the exact length you want them. For my almost-6-year-old, they are about 15 inches, for the 2 year old they are about 13 inches. 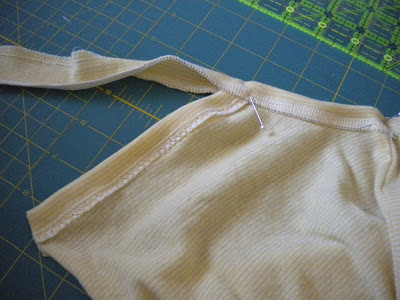 To attach the straps, start at the underarm seam and pin the strap onto the tank with the elastic side on the right side of the fabric. Then take the opposite end, fold it over about 1/4 inch and pin it into place just over the already pinned end. Continue pinning around the entire strap, keeping the serged edges even all the way around. Zigzag on top of the serged edge all the way around, removing pins as you go. Again, make sure you catch the under edge of the strap as you go. You will also want to stitch a little seam right over the top of where you overlapped your strap pieces under the arms to keep it in place. 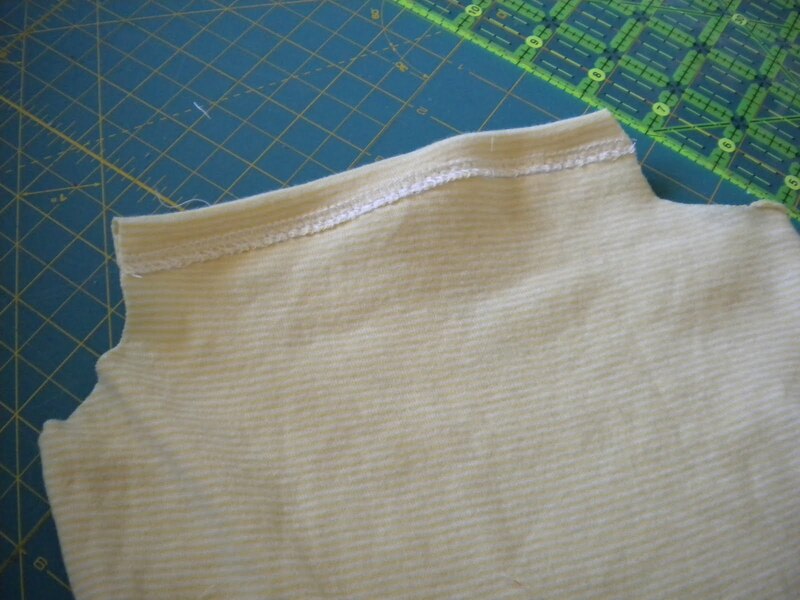 If you want a hem band, attach it the same way as the top binding, matching the side seams. If your band length is shorter than the hem length, pin the band in place on the side seams and at the center points of the front and back, then stretch slightly as you stitch around to take up the slack. 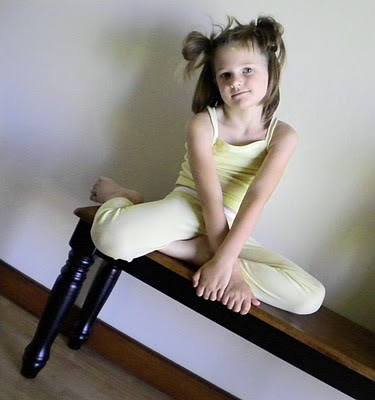 An easy, cheap, adorable tank perfect for layering! I like this! Another great project of yours. Thanks for taking all the time to write this all out, take the pics, and share with the rest of us!! LOVE IT!! Great job! Love those tanks. Just had to add that I LOVE that last photo! 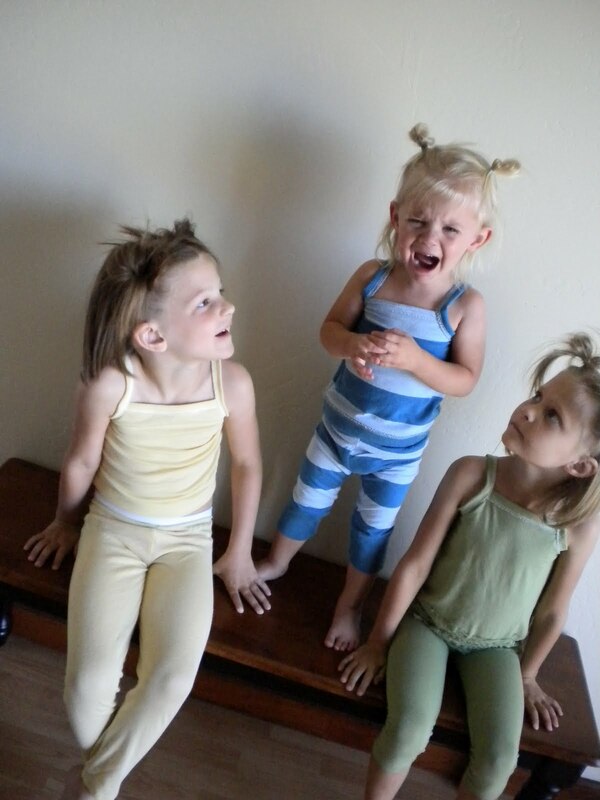 Your girls will treasure that one when they're adults, I'm sure. Thanks for sharing! These are so darling! 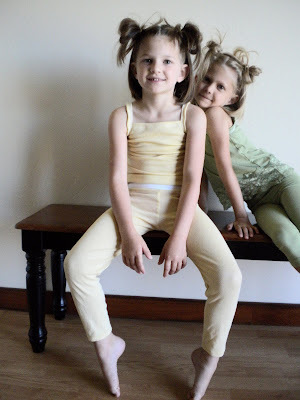 I'm featuring this at somedaycrafts.blogspot.com tomorrow! I'm a new follower! Thanks for sharing!!! I have a giveaway on my blog, would you check it out? Thanks!